Attention current Reading students: Alumni mentors have been signing up to help you prepare for the working world. The University of Reading’s Thrive mentoring scheme is available for you to experience what it is like to graduate with a Modern Languages degree. 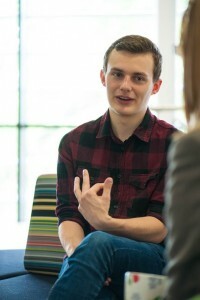 All of the mentors have studied at the University of Reading, in Modern Languages and European Studies and are now working, using their degree. What is even better is that they want invest their time in you, to support you in making your transition into the working world! Why should I sign up for a mentor? You have the opportunity to practise your language skills with a professional! All you need to do to have these opportunities at your fingertips is sign up! You can then work with your mentor for twelve months and will achieve some great things throughout the year. Contact your mentor when it is convenient for you via email, Skype, WhatsApp or if possible face-to-face; develop your skills and gain insight to the working world. Thrive is a brilliant opportunity to take the first steps into considering what you may like to do with your degree.